2. Why Jesus did not first wash before dinner? To prepare an analysis of Lk 11:37-41, we want to present three points: (1) Text of Lk 11:37-41 (RSV-SCE); (2) Context of Lk 11:37-41; (3) Structure of Lk 11:37-54. Our study text (11:37-41) is the first part of this section. 37 While he was speaking, a Pharisee asked him to dine with him; so he went in and sat at table. 38 The Pharisee was astonished to see that he did not first wash before dinner. 39 And the Lord said to him, "Now you Pharisees cleanse the outside of the cup and of the dish, but inside you are full of extortion and wickedness. 40 You fools! Did not he who made the outside make the inside also? 41 But give for alms those things which are within; and behold, everything is clean for you. Lk 11:37-41 connects with the preceding passage (11:29-36) and the following (11:42-54). First, in 11:29, Jesus said to the crowds: “This generation is an evil generation; it seeks a sign, but no sign shall be given to it except the sign of Jonah” (11:29). Jesus reprimands the crowds as “an evil generation”, this idea reappears in the passage 11:37-41 in which Jesus accuses the Pharisees: “Inside you are full of extortion and wickedness” (11,39b). Secondly, Jesus said in 11:35-36: “35 Be careful lest the light in you be darkness. 36 If then your whole body is full of light, having no part dark, it will be wholly bright, as when a lamp with its rays gives you light.” This saying about light and darkness (11:35-36) links with the idea of human beings’ inside and outside in 11:37-41. In section 11:37-54, Jesus reveals the inside of the Pharisees and the lawyers which are full of darkness. When they are “clean” outside and “unclean” inside, means “the light inside them is actually darkness” (cf. 11:35). The conversations during a meal are a characteristic activity of Jesus in the Gospel of Luke. The story is about a Pharisee who invited Jesus for a meal, Jesus accepted his invitation, “he went in and sat at table” (11:37). Then the conflict ensued when “the Pharisee was astonished to see that he did not first wash before dinner” (11:38). The narrator reveals to readers Pharisee’s astonishment, while the Pharisee said nothing. In the context of 11:17-54, the Pharisees and the lawyers were also present at the table and these two groups appeared one after the other: first the Pharisees (11:37-44) and then the lawyers (11:45-52). 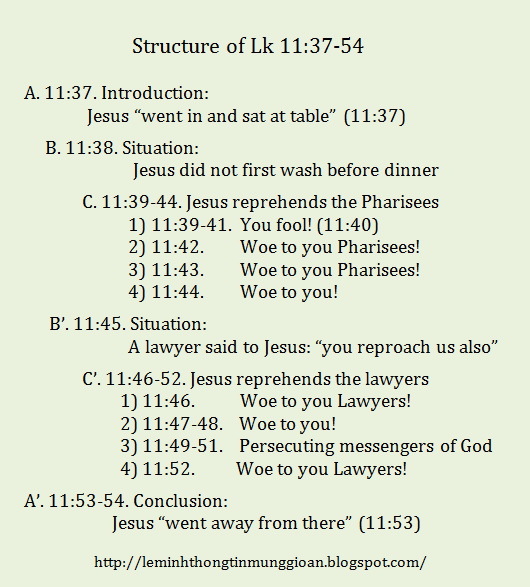 We treat five ideas in Lk 11:37-41: (1) Jewish ritualistic washings, (2) Why Jesus did not first wash before dinner? (3) Inside and outside cleanliness, (4) The maker of “outside” and “inside”, (5) Give for alms. The narrator uses the Greek verb “baptizô” (to baptize) in the sentence: “He [Jesus] did not first wash (ebaptisthê) before dinner” (11:38). The verb “baptizô” means to baptize, to dip, to immerse. John the Baptist realized this ritualistic immersion and Christians are baptized “in the name of the Father and of the Son and of the Holy Spirit” (Mt 28,19). In the context of Lk 11:37-41, the verb “baptizô” refers to Jewish ritualistic washings. In this particular context, “washing” does not only mean to wash one’s hands, but, figuratively, it also means purifying (cleansing, washing) one’s heart (spirit), because Jesus talked about the inside and outside cleanliness of the cup / dish. These two dimensions (planes) refer to body and soul, the whole of human beings. Since purification is central to the Pharisaic worldview, Jesus took this opportunity to disclose the real sense of purification according to God’s will. Jesus does not respect the convention of “wash before dinner” (11:38). From the point of view of Pharisees, Jesus is in the wrong. Why Jesus did not first wash before dinner? Jesus’ behavior could indicate the custom of Lukan community, the majority members of which came from the pagan world, they were not Jewish; hence they (Christians) were not obligated to practice this Jewish ritualistic washing. In the story, the narrator called Jesus “Lord” (11:39). His holy capacity to know the inside truth of human beings indicates that Jesus is a revelator of God’s will. Jesus is the Lord of the community and he teaches us the new way to enter into relationships with God the Father. Through the story, Jesus invites everyone to live according to his teachings. Jesus reprimands the Pharisees: “Now you Pharisees cleanse the outside of the cup and of the dish, but inside you are full of extortion and wickedness” (11:39). There are comparisons between the inside and the outside of the cup / dish with the inside and the outside of human beings. The outside of the cup / dish is in parallel with the external ritual; and the inside of the cup / dish is in parallel with person’s inner intentions, the depths of human beings. These Pharisees appear like those who have “body full of light” which become “full of darkness” (cf. 11:34-35); they pay attention to outward appearance in their strict observance of laws, but their inside are greedy, full of wickedness. Jesus denounces the incoherence between the “outside” and the “inside” of the Pharisees. Their outsides are clean according to the external ritual but their insides are unclean, because they are full of avarice, craving and wickedness (darkness, evil). The rhetorical question: “Did not he who made the outside make the inside also?” (11:40) uses an image of “maker” which refers to both the maker of crockery (cup / dish) – an artisan; and the Maker of human beings – God. Men are responsible to God for their internal dispositions as much as for their outward observance. God, the knower of heart, can see the darkness in the innermost of human beings. 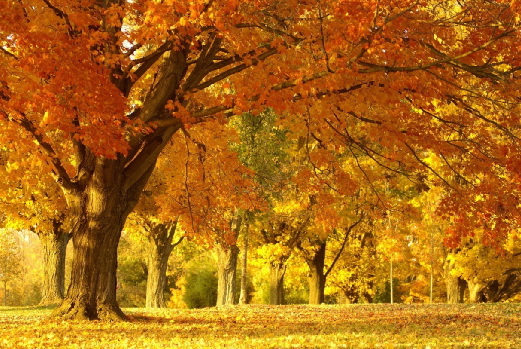 How can we purify our inside and outside if we want to live in accord with God’s will? Jesus proposes the way to cleanse our interior and exterior: “Give for alms those things which are within; and behold, everything is clean for you” (11:41). In this sentence, the internal purification deserves priority over external observance. In other words, internal qualities should be expressed by almsgiving. Giving away the contents of the cup and of the dish (imagery for giving his possessions for alms) as alms to the needy can wash out one’s life from greed, wickedness and darkness. By giving for alms, being charitable, the outward preoccupation will give way to real concern for inner cleanliness. The story emphasizes the theme “inside” and “outside”. Jesus shows the incoherence between the outward practices of purification as ritualistic washing before meals and the “inside” full of extortion and wickedness. The purification of the Pharisees neglects the necessity to unify inner life and public behavior. Because both are made by God, neither should be overpassed. They lack a fundamental orientation to God’s purpose; for that their behaviors are exposed as wickedness. The fact that a Pharisee invited Jesus to dinner shows his willingness to Jesus. Therefore, through the story, Jesus invites his audiences to practice the purification that can make them clean inside and outside: It is “to give for alms”, the way that God wants./.